So were off for a while, catching up with friends all over the UK, should be fun. Only 1 gig booked, that’s Bricolage in Glasgow. Will let you what we got up to when we get back. 6 – 0! Yes, Six – nil, no matter how you write it it’s still amazing to see City win a league game by 6 clear goals. To be honest it could have even more, so inept were poor old Gillingham, you had to feel sorry for their fans. Such a long way to travel, for such a shocking performance, I’ve never really been sure why people travel such lengths for a game of football. I’ve never really been to more than 5 or 6 away games in the course of season, in fact which the exception of the play off final in Cardiff a couple of seasons ago, I don’t think I’ve been to any away games in the last 5 or 6 games, no matter much City improve, I think that my away days are over, really – life’s too short. Other than that, I enjoyed a very funny evening at The Cube on Friday night. A couple of my friends arranged the a gig for the maverick Scottish poet Jock Scot, They are putting out “The Caledonian Blues”, the latest album from Jock, which features musical input from erstwhile Bristolian Gareth Sager. The pair of them played a brief but very entertaining set, Sager seemed to get enormous pleasure from making a seat squeak, whilst playing guitar and Jocks poems and banter were entertaining and enlightening about his rather chaotic existence. Free Cider and a DJ set from Geoff, consisting completely of bagpipe music made it a night to remember. Today we nipped up the road to see “Good night, And Good Luck” at The Orpheus enjoyed the film as any leftie would. Also made me think that everyone looks good in black and white. Well maybe not quite everyone! OK we admit it, we are old! A couple of weeks ago we bought a shredder, so we can take care of all those bits of paper which have our vital details on it, before the hoards of international criminals descend upon our casually discarded paperwork, taking away all our hard earned money. I well remember laughing at Orynthia’s mum a few years ago, when she refused to put anything in the bin, which had her name on it. What excuse do we have for such grown up behaviour, well not much really. It’s just that virtually every bit of post which we receive these days appears to be from some sort of financial institution offering to lend us loads of money, which is obviously lovely and oh so sweet of them. The worry is that as we cheerfully throw these things away, someone else decides that they would like to pretend to be us and suddenly we have a nice little debt to take care of. Have to admit that shredding is great fun, must remember not shred any actual money, as that would rather mess up our wonderful idea. We had some top fun in Bedminster on Saturday afternoon, whilst Orynthia was driving along North Street in search of a mid afternoon snack, I spotted a great looking second hand shop, only a couple of doors away from a café/second hand bookshop, shopping heaven. Orynthia picked up a wonderful old coat for £10 and some great 60’s crockery (3 plates for a £1! ), and then we went into the café. After ordering our drinks and snacks we took our place at a table and started to browse through some of the nearby books. It was then that I noticed the chap on the table next to us, nodding slightly over enthusiastically to the generic 80’s hits CD which was playing. We continued to chomp, slurp and browse as the sound of Thompson Twins filled the air, the guy was around my sort of age but looked as though his mum still shopped for his clothes, maybe even dressed him as well. Really mum, those white socks really aren’t a good idea. Then I started to notice that he was adjusting the volume and skipping tracks, so I guess he was the in café DJ, nice work I thought. Suddenly whilst Two Tribes by Frankie Goes to Hollywood was playing, someone else asked what the tune was? Brilliantly our DJ friend launched into a polemical discourse regarding the cold war atmosphere of 1984, which had inspired the song, he reeled off fact after fact in rapid time, before going onto lament that The Power of Love by F.G.T.H. was a sadly overlooked gem, which wallowed in underserved obscurity, in fact the whole tone of his conversation indicated that he thought the Frankie’s were an obscure cult band that never really got the attention they deserved. Fair enough if he was a young chap, but obviously that was not the case, as anyone who can remember the days of “Frankie Says…….” will remember only too well, for a while in the mid 80’s we all saw more of them than we did of our families. We amused ourselves looking at books of pie recipes and pictures 19th century Burmese girls, smoking huge cheroots, trying desperately not to make eye contact with our DJ friend, before dashing for the door. Top place though, must go back soon. Talking of top quality DJ’s Sundays Grumpy Man gig was a little strange. We only played for about 2hrs 30 mins as the evening was also a launch night for Helicon magazine. A few friends were amongst the performers and most of the crowd hung around to hear us putting a lie to the notion that anyone can DJ. My own highlight of the evening was one of my colleagues getting most of the way through an Elvis track, whilst remaining convinced that he was playing Billie Holiday, genius. The next one is on April 30th make that a date in those oh so busy diaries. We had a wonderful night at the ever more bizarre Seymours on Wednesday evening. 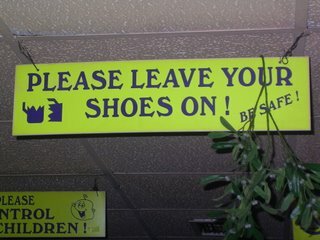 In addition to some really rather splendid music, the venue itself provided us with lots of fun; the place is covered with signs instructing the punters exactly what is (or is not) permitted. 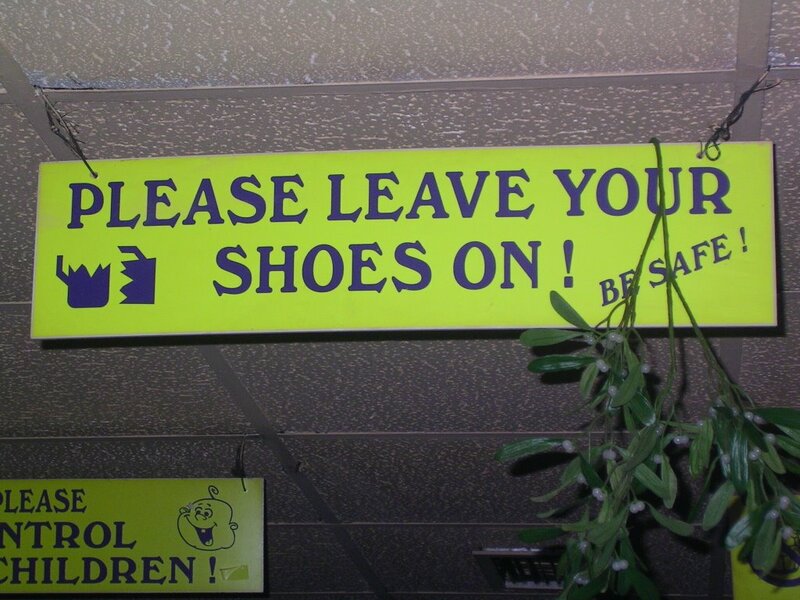 Best of these, is the sign advising that you should “Keep your Shoes on – Be Safe”. Clearly Sandie Shaw could never play a gig there. The music? Well the evening started with Rozi Plain and Romanhead playing together. Poor old Rozi must be worn out, virtually every time we step out of the house, she’s there playing with someone or other. Not that I have a problem with that, she has some good songs and interesting arrangements are a speciality of hers. Next up were M. Craft, not someone I knew much about before the gig. The band he has assembled provided a pleasant, understated backing for his American fringed songs. Nice enough without really standing out, I’d mark them as mid-table performers. King Creosote however is certainly heading for the top of the league. Wonderful songs, sung with real intensity, making even the murky world of accordion lead folk tunes seem vital. His great band provided superb support, whilst keeping a cheeky grin on their faces at all times. The packed crowd lapped it up, demanding several encores. Yet another sad death this week, the passing of Ivor Cutler was no great shock as he was in his 80’s, but still came as unwelcome news. As with so may things, I first came across his work on the John Peel show in the 1970’s. He had a unique view of the world, telling the most ludicrous stories in a voice that would normally be used for serious political debate, he was a unique performer. We only saw in the flesh once, that was at the Bristol Old Vic back in the 1980’s it was a strange evening, Ivor appeared to take no pleasure in the joyous reception which he was given, keen to do his bit and get off as soon as he could. Everyone in the crowd loved it, he was like the perfect example of the strange uncle in the family – the kids all love his strange ways, whilst the adults never quite know how to respond to things he says. End of an era stuff. Another Grumpy Man night at Mr Wolfs coming up on Sunday. It’s been a very musical weekend around here. 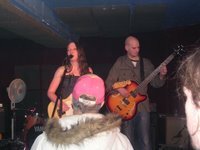 Friday evening saw us visiting a wonderfully buzzing and lively Louisiana, a couple of our friends are playing in Amelia Tuckers band, we’d missed a couple of gigs by them recently and had been hearing good things about the shows, so it was time to check them out. Three other bands were in action as well, because of the early start we missed Rob Sharples completely, Caught a bit of Roger Tarry, who sounded ok without quite having the killer melody lines which his sort of music requires. 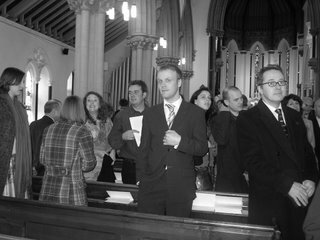 Seven Days Til Sunday make big confident rock music, which would suit the lighters in the air brigade, not really my sort of thing but other people seemed to enjoy it. Onto Amelia Tucker, well as I mentioned a lot of positive things have been said about Amelia over the last few months, but after hearing the songs on her myspace site I was not so sure. Pleased to say that the live show had much more of a positive impact of me, vocally much more like Tracey Thorn from the Love not Money period than I had anticipated some of the songs in the short set were excellent. There was an element of over politeness about the show, but you do the get feeling that she could produce something special if she if she could really lose herself in the music and turn up the intensity a notch or two. One to watch. Saturday dawned wonderfully clear, crisp and cold. I spent the afternoon at Ashton Gate watching a rather messy game of football between City and Notts Forest. At the start of the season, I think that most people thought that we would both be at the top half of the table, slugging in out for promotion, as we all know things have not worked out like that. A change of manager for both clubs has bought improved results of late, but the 1-1 all draw should way both clubs are no better than mid table at the moment. 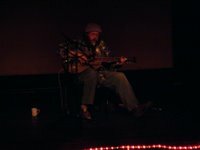 On Saturday evening we were back at The Cube for another helping of musical dynamite, in the form of Charlie Parr. First up were the now expanded My Two Toms, playing last night as a 4 piece, they were at their melodic best as than ran through a set of splendid instrumental’s with the banjo at the heart of the action. Once again Adrian Cowley played a low key bit in the middle, before the wonderful Mr Parr took the stage. He played a blistering set, tearing into what some would call folk, or country-blues with the vigour, energy and passion of The Ramones. His big gravely voice can bellow ferociously or whisper with disbelieving horror of mans ill treatment of his fellow souls. He really is the stuff of legend, word is that when he returns to Duluth, the beard of 13 years will be removed, can’t see it diminishing his powers though in any sort of Samson type way as he jokingly mentioned during his set. Let’s hope it’s not too long before we see him back here again. Next up is King Creoste on Wednesday. Finally got round to making a visit to the cinema last night when we went to see Capote at The Watershed. It’s a fantastic portrait of the way vanity and selfishness can destroy the most brilliant of people. How strange though that Capote and Harper Lee should work so closely on the book “In Cold Blood” whilst she was releasing “To Kill a Mockingbird” to a grateful public. Yet, following the huge success of both books we hardly heard from them again. From the little I know about Harper Lee. It looks like she choose a self-imposed exile in much the same way as J.D. Salinger did. Capote’s situation was very different as he promised to produce the next great work right up to his death, able only to produce some enjoyable short stories and a disappointing posthumous release. Sadly the sparkle and wit of his conversation became his calling card rather than his writing. Even that appears to have left him in later life as his comments became spiteful and aggrieved rather than charming. 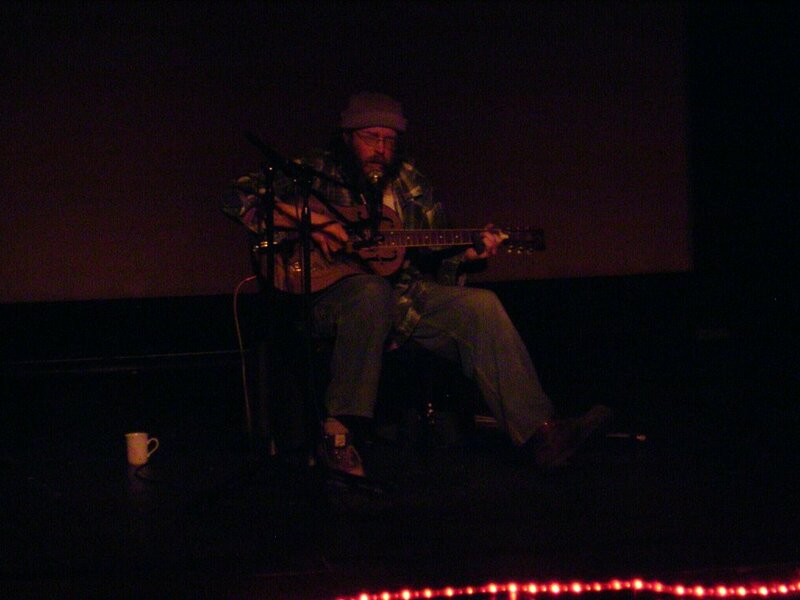 We are off to see the splendid Charlie Parr at The Cube tomorrow night. One the fondest memories of my time at Imperial Music was the day that Charlie came into the store to play for us. A lovely man, with an inspired take on American blues music it should be a great night. To hear him attacking that guitar of his with such gusto, whist singing with the weight of the world sitting on soul is one of the great things in music. A couple of other things come to mind. Firstly isn’t it great to have some in the England cricket team called Monty? Pretty soon they will be using ties for belts and having handle bar moustaches once again. Sadly the other thing is not so good, we were both really shocked to hear that Linda Smith had died earlier this week. She was the probably the sharpest, funniest person in the UK. Never cruel, but able to put the pompous in their place with the most subtle of put-downs, she captured the absurd nature of the British character perfectly. She will be missed.